Nope I'm not at a high altitude, lol. I think I'm just a bit batty from some stress. I've been working on a couple presentations. I did one yesterday and got some really great/helpful feedback. And I'm speaking on Friday too! I'm really excited to share some of the work I've been doing, but I'm also stressin' trying to get my slides together. 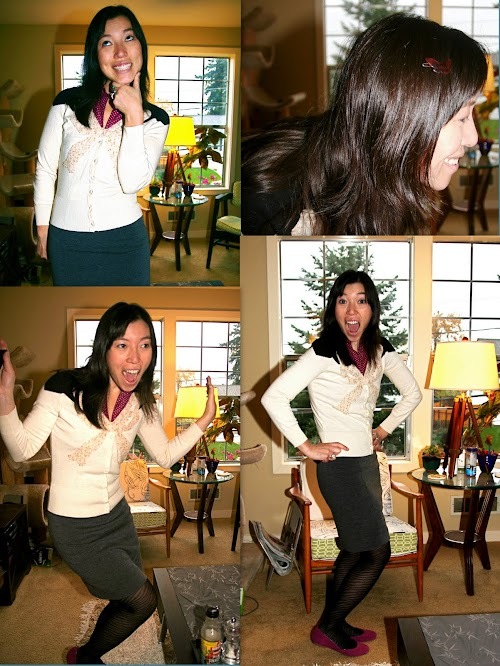 The stress apparently made me make really wacky poses in my ootd shots. Kinda hilarious. Kinda silly. Kinda weird. Wait, I think that's me in a nutshell. I was running out of purple things to wear on Friday, and I was trying to dress down and stay warm. So this is what I ended up with. 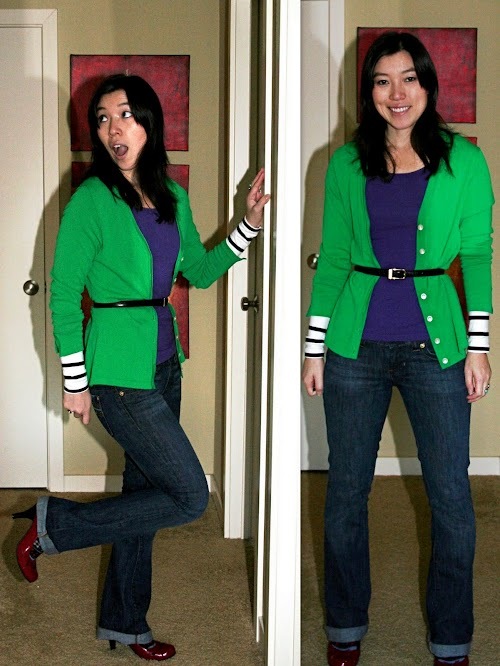 I'm not sure I like the belt here, but the cardigan needed it. Otherwise I look like a very big box - with legs. These were my only pair of clean jeans! I haven't yet hemmed them (I usually just roll them and walk the dog in them). I have stubby legs. 30" inseam is good if I don't wear heels. With heels, 32-33" is nice. I pulled out my Precious Materials Cardi because 1) I was sad I was so sickly the last time I wore it, and 2) I thought it would be warmer than some of my other cardis? I dunno. I wasn't thinking very straight. Something about how cashmere would keep me warm. This is what I wore under the cardigan! Hooray for polka dots! I admit, I was really tempted to wear my zebra cardigan to go with my zebra tights. But that cardi definitely wouldn't have added any warmth. No way, no how. Oh today. Yes, the poses got even sillier. Here I am showing you the Baccarat pig that my husband's middle school English teacher gave us as a wedding gift (they have a pig gifty thing going). And what's a round of silly pics without my trademark open-mouth jaw-drop pose? 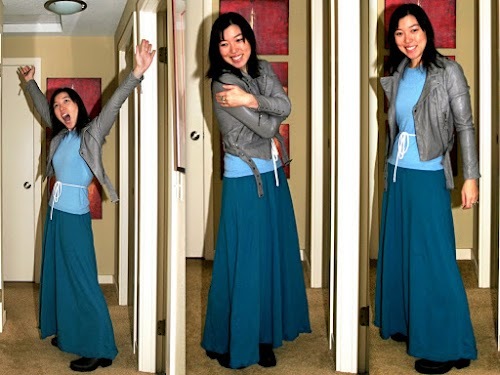 I'd been wanting to try out the cold weather long skirt trend, but it's really hard in Seattle if it rains. Wet hemlines. Ew. Luckily, no rain today. I did try to layer like crazy in case I got cold. What you can't see here is the tank top, the leggings and thick boot socks I've got on under my dress. Then on top of it all I put on a wool sweater and jacket? Yeah I was too warm today and ended up stripping down to the tank dress in the office at times. Then it looked like a totally different outfit. Not what I planned, but still better than being too cold. The rope belt is actually the belt that came with my mom's dress from a few posts ago. For some reason I didn't want a more structured belt today. Or maybe that piece in Lucky mag about bow-knotted belts affected my subconscious. Also, I realize I'm behind in responding to y'alls comments, but I will get to them after this week. I promise! You look great in the precious materials cardi - i wish i could have snagged it on sale! Also loving those zebra tights - how cool!! I like the pic of you holding the baccarat pig. cute! I love your silly poses too! Public speaking is one of those things that freaks everyone out! Just remember to breath! Dude...the Precious Materials Cardi is totally starting to haunt me now. I must have seen an xs like a million times in person and NOW all the sudden I want it? WHAT IS WRONG WITH ME!?!? It looks so cute on you!!! Some people look really strange when they do silly poses, but you just look like you're having so much fun! You're not too serious and it makes looking at your outfits so much fun. I can't believe you got the BCBGMAXAZARIA grey pencil skirt for four bucks! Just reinforces the need that I need to go thrifting! You're so cute in your outfits...thank you for sharing. Ugh...I hate presenting but I'm sure you'll do great. :) Good luck! You make me smile :-) Love your silly post. You look so cute and colorful. People around you must love you because your presence will brighten up the raining gloomy days. I told Jamie when she first started using this comment format that I don't like it. Especially since I have a bad memory at 50. Soon to be 51. I can't see your images now. Here goes. You have metamorphoses into a one girl style blogging comedy act that is so lovable and intriguing. I once said how wonderful it would be to have a blog convention and meet each other. All your outfits were lovely Lori. I still adore those red shoes in the first. And funny I thought the long Blue skirt was actually very wide pants at first. You have a unique style all your own. Keep speaking LORISPEAK. And I will keep reading! I didn't finish the beginning. See what I mean? Jamie immediately changed back to the default comment format. Not that I expect you to do the same. It's just difficult to remember so many OOTDs all at once. I do like this format best for the word verification though. Sometimes I hit post comment and I get bounced to the top of the blog and forget to go back down and go thru the word verif step. You are awesome and worth the effort to jog my poor memory. Your outfits are always so creative! I especially love all of your layering in the first outfit...The stripes peeking out were genius! OK, lady, your waist is teeny tiny - ooh, I'm jealous! @Kay have you tried CS? Maybe there's still one hiding out there? Hooray for payday!!! @Laura thank you for letting me know about the diff comment formats!! It was so helpful! !